In my continuing efforts to deal with the “no dairy, no soy” dietary restrictions, I’m always on the lookout for desserts that I can both eat without guilt, and with pleasure. So when I saw this on the shelf at my local Harris-Teeter, I picked it up. The ingredients are thus: Sugar, Non GM corn syrup, cocoa processed with alkali, natural cocoa, carob bean gum, guar gum, carrageenan. Obviously, the lack of butterfat means that it doesn’t taste like ice cream. No getting away from that. 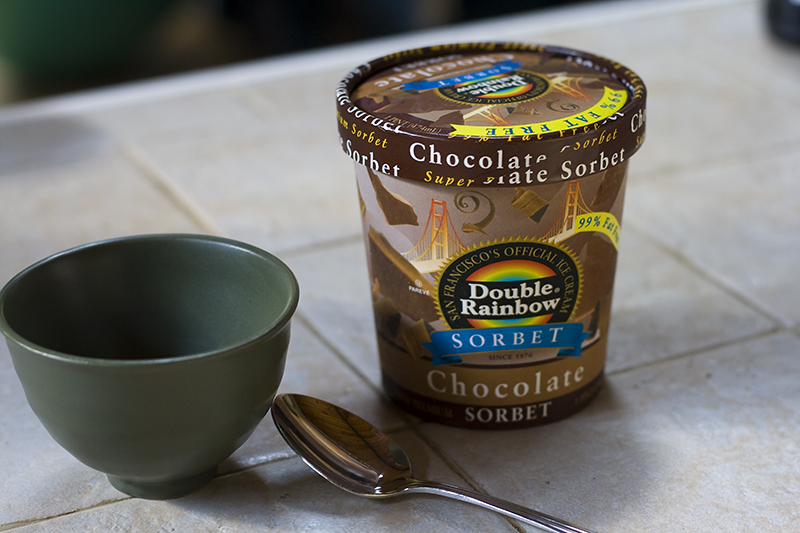 But the chocolate flavor is rich (although with a hint of that weird plastickiness that I associate with carob – this isn’t belgian chocolate, folks, and doesn’t pretend otherwise), and the sorbet is creamy and has good mouthfeel. Honestly, the closest thing I can say that this comes to in flavor/texture is the Fudgesicle Fudge Pops – remember those? Mind you, I like fudge pops. So for me, having an entire tub of solid fudgepop isn’t a bad thing, but ymmv. If you are interested in dairy-free soy-free ice cream there is a great product called mimiccreme for making your own. It really comes out tasting like chocolate ice cream! Check out my blog for some recipes using it. All my recipes are dairy free and the soy free ones are labeled as such. Your blog is already in my reader, I enjoy it tons 🙂 Thanks for the recommendation – I hadn’t heard of that product before! I did try the Purely Decadent coconut ice cream lately (was going to post about that in a separate post, but still need pics 🙂 ). It was tasty!